I was on Portland's KATU Afternoon Live TV show to cook Tikil Gomen (Ethiopian Cabbage and Carrots) with host Tra'Renee. Here's the video of the show, and the recipe is below; enjoy! Put the sliced onion in a medium pot and sauté for about 5 minutes, then add the oil and continue to sauté for 2 more minutes. Stir in the minced garlic and ginger, and cook until you smell the aroma from the garlic, for about 1 to 2 minutes. Add the turmeric powder and simmer for 3 minutes. Stir in the cabbage and carrot mix and water, cook for about 10 minutes. Add salt to taste. Thanks to Andy & Mauria at Relevant Studios for the wonderful new food photos! Though she holds a master’s degree in accounting, Eleni Woldeyes never felt as comfortable behind a desk as she does in her kitchen. She only spent a few years working as a number cruncher before launching Eleni’s Kitchen, the Hillsboro Farmers Market stall where she sells traditional Ethiopian cuisine. “I ended up not liking working in the office … this is what I want to do,” she said. Woldeyes was born in Ethiopia, where she lived with her extended family. Then, in 2001, her mother received an invitation to attend a relative’s wedding in Atlanta, Ga.
“We had always wanted to come (to the United States), so when we got the wedding invitation, that was it,” she said. After the wedding, the family moved permanently to the U.S.
Woldeyes met her husband in Atlanta while earning her master’s degree. When he was hired by Intel, she moved with him to Oregon. For the first time, Woldeyes was separated from the close-knit family she had grown up with. She sought solace in the food that reminded her of home — spicy chicken and tender beef, served with aromatic chili dipping sauces over injera, the massive sourdough pancakes that are an iron-rich staple of Ethiopian cuisine. “Being by myself, I really connected to my Ethiopian cooking,” she said. After her first son was born, Woldeyes found herself at home with a lot more free time, which she filled by experimenting in her kitchen. After months of fine-tuning, she perfected the seemingly unattainable: a recipe for kulet, the spicy, simmered sauce ingrained in Ethiopian cuisine. By preserving the sauce, anyone could enjoy East African gourmet without the laborious, time-consuming process of making kulet from scratch. With her jars of the chili sauce flying off the shelves of boutique grocery stores as far away as Massachusetts and Canada, Woldeyes opened a stall at the Orenco Station Farmer’s Market. Starting in August, customers will also be able to purchase Woldeyes’ wares at the downtown Hillsboro Farmers Market. She plans to introduce her selection of breakfast dishes, sweet strawberries and bananas over the injera, but will still prepare savory meat and lentil toppings alongside her new menu additions. Her signature chili sauce, which was spotlighted in a 2009 edition of The New York Times Dining and Wine selection, is available every day of the week at the Tanasbourne Whole Foods. Eleni’s Kitchen Red Pepper Sauce was featured in the “Front Lines,” a publication of Food Front, a Coop Grocery Store in Portland, Oregon. Here’s the full text of the article. It all started with a dream to have simple-to-cook, yet authentically prepared Ethiopian sauce with which one could cook delicious meals at any time. With the knowledge of traditional Ethiopian cooking and with the help of her mother, Eleni spent almost two years looking for authentic Ethiopian spices at markets in Oregon. She brought together the best spices that resulted in her company’s first product: Eleni’s Kitchen Kulet-Red Pepper Sauce—sautéed simmered sauce (called Kulet in Ethiopia) prepared from onions, berbere (spiced red chili powder), vegetable oil (canola, soybean), garlic, ginger & other spices. This sauce is the base used to prepare gourmet stews (beef, lentils, chicken, etc). Made from all natural ingredients, making a stew from Eleni’s Kitchen Red Pepper Sauce is as easy: just add a few cups of water to a pot with a jar of the Red Pepper Sauce and lentils, beef or chicken, and cook for 30 minutes or until the lentils are done or the meat is tender. Eleni’s Kitchen, LLC is locally operated in Hillsboro. —Gary Koppen, your Grocery Manager. It is with great excitement that Eleni’s Kitchen, LLC announces to its customers that its product – Eleni’s Kitchen Ethiopian Red Pepper Sauce (KULET) – is now available at the Tanasbourne Wholefoods Market in Hillsboro, Oregon. Wholefoods Market is the world’s leading natural and organic supermarket and supports local growers and producers. 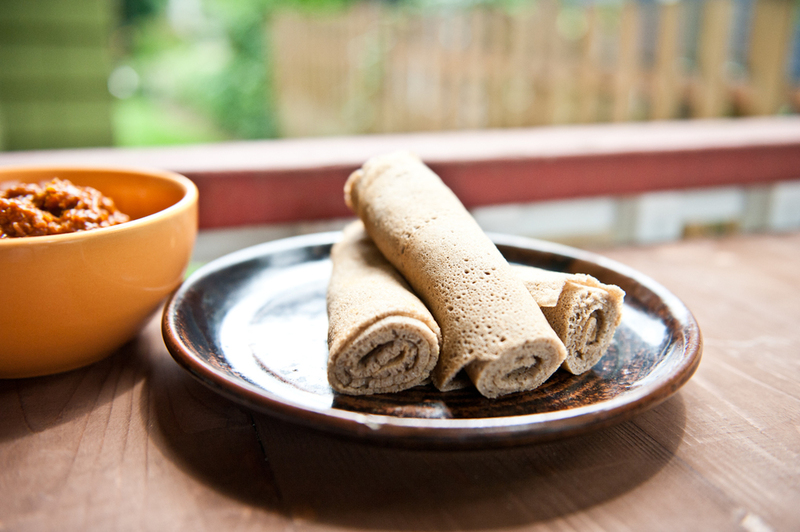 Eleni’s Kitchen, LLC is committed to providing Ethiopian foods made from all natural ingredients. The company’s first product, Eleni’s Kitchen Ethiopian Red Pepper Sauce (KULET), is prepared from simmered onions, berbere (Ethiopian spiced red chili pepper powder), oil (canola, soybean), garlic, ginger and other spices. In addition to being available at the Tanasbourne Wholefoods Market in Hillsboro, Oregon, Eleni’s Kitchen Red Pepper Sauce is also sold in co-op grocery and local Ethiopian stores in over 10 states in the United States and in Canada. For the full list of stores where you can find the sauce, please visit ElenisKitchen.com. It all started with a dream to have simple-to-cook, yet authentically prepared Ethiopian sauce with which one could cook delicious meals at any time. With the knowledge of traditional Ethiopian cooking and with the help of her mother, Eleni Woldeyes, the founder and manager of Eleni’s Kitchen, LLC, spent almost two years looking for authentic Ethiopian spices at markets in Oregon. She brought together the best spices that resulted in her company’s first product: Eleni’s Kitchen Red Pepper Sauce (called Kulet in Ethiopia). This sauce is the base used in preparing gourmet stews (beef, lentils, chicken, etc). Made from all natural ingredients, making a stew from Eleni’s Kitchen Red Pepper Sauce is as easy: just add a few cups of water to a pot with a jar of the Red Pepper Sauce and lentils, beef or chicken, and cook for 30 minutes or until the lentils are done or the meat is tender.